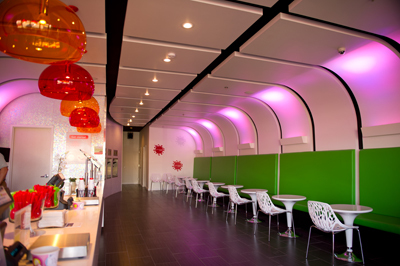 When you step into the newly opened Berry Berry Good Yogurt on Highway 51, you’re immediately struck by the… futuristic decor of the shop. White curved ceiling, textured wall coverings, mother of pearl styled tile around the yogurt machines – the feeling is clean and modern. In fact, all three local locations of Berry Berry Good are similarly laid out. The decor strikes even the casual observer, but the benefits of a stop at Berry Berry Good goes far beyond the aesthetic. The treat you have stopped to enjoy is “berry berry” good for you in so many other ways. You go to Berry Berry Good to enjoy their delicious yogurt. What many people do not know is that when their yogurt is made, it naturally has healthy bacteria, known as probiotics, that are actually good for the human body. We see commercials on TV all the time, touting the health benefits of eating yogurt. The probiotics in yogurt have been shown to be beneficial in such human health processes as aiding digestion, lowering cholesterol, boosting the immune system, and easing various gastrointestinal problems. Unfortunately, many standard commercial processes in the making of yogurt eventually eliminate the beneficial probiotics. There are many factors involved in producing a product that can support these living bacteria, such as the product’s temperature, pH, oxygen, water levels, etc. It is obviously more expensive to constantly monitor all of these factors during the making of yogurt, so it actually ends up that many of the commercially available yogurts have not been carefully monitored and therefore do not contain any significant level of probiotics. The companies that produce the healthiest (and usually tastiest) yogurts are the ones that carefully monitor all of the various components of the process. These quality yogurts might be slightly more expensive, but the flavor and health benefits are definitely worth the cost. “We don’t cut any corners when it comes to the products we offer our customers,” says Berry Berry Good Yogurt owner Kam Ngai, “we want people to get the best tasting yogurt and all of the benefits that come from natural yogurt.” Berry Berry Good wants to make sure that people know they are bringing in the types of yogurts that are not only delicious, which they definitely are, but the yogurts you will find in their stores are also healthy and rich in the natural probiotics. A visit to Berry Berry Good Yogurt is healthy, but for many the main thing that sticks is the fun. It begins with choosing which size cup you will fill with the silky delicious yogurt. Then you proceed to the “wall of yogurt” to select the flavor or flavors that you will enjoy. It’s all self-serve, so you can mix and match flavors however you choose. Finally, you have an array of topping to choose from. The toppings range from fresh-cut fruits (another healthy choice) to candies, nuts, and melted sauces like caramel and chocolate. When you are finished, take a moment to take pleasure in the sight of your new creation before sitting down to enjoy your healthy and delicious yogurt treat! Berry Berry Good has locations in Madison and Flowood. For more information including nutritional and probiotic benefits, visit www.berryberrygood.com. Author Matthew Jackson is a member of thinkWRITE Guild and a contributing writer to County Connections.